Book your $21 special now! 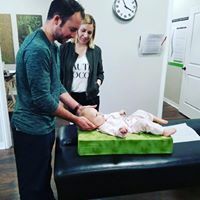 With chiropractic having entered its second century, it is essential that a truly up-to-date, functional, vitalistic, scientific model go along with it. Torque Release Technique (TRT) is a low force chiropractic technique that specifically focuses in on each individuals nervous system and removes subluxations through a handheld instrument called the Integrator. TRT focuses a lot of attention to the strategic and vital connection points between the spinal cord and spinal column. As we gently and methodically adjust these areas of your spinal cord, we are changing the degree of tension in the central nervous system in an effort to achieve a better level of tension. “TRT” is the most up-to-date chiropractic technique available. The Integrator™, a torque and recoil release adjusting instrument combines the best of existing chiropractic techniques and principles, quantum physics and the body/mind connection, creating the first integrated chiropractic system for the second century of chiropractic. An instrument was developed by Dr. Holder for the purpose of delivering an adjustment identical to that of the chiropractor’s hands. Instead of delivering just axial force, the “Integrator” delivers a third dimension of force; recoil, as well as torque, all at the speed of 1/10,000th of a second. The Integrator™ is the only chiropractic adjusting instrument that was developed out of a randomized clinical trial, blinded and with placebo control. The study was performed on individuals with addiction problems, anxiety and depression. The results of the study were unheard of due to the amazing results the participants experienced. This was truly groundbreaking research for the chiropractic profession. Click here to see the results in detail. No instrument in chiropractic history has been able to reproduce what the hands were intended to do until now. Many other features are built into the Integrator however the precocking/tip sensitive automatic release mechanism makes the Integrator the first and only chiropractic adjusting instrument capable of totally true inter-professional reproducibility and allows each patient to receive the perfect adjustment at any given time. The Integrator™ is a legally marketed instrument in the United States and the only instrument certified by the FDA for the removal of subluxation.